Do you have signs of sleep disorder? A sleep disorder is any type of physical or psychological reason for not getting enough sleep or getting too much sleep. According to the Centers for Disease Control and Prevention, feeling sleepy during the daytime is not normal. Those suffering from problems falling asleep or staying asleep should address these problems with their doctors. Snoring accompanied by pauses in breathing is a sign of the sleep disorder sleep apnea. This life threatening condition is caused by a blocked airway. To fix the situation, the brain wakes you up, just enough to readjust. This leads to poor sleep quality. Stress and surroundings can make it difficult to fall asleep. Others suffer from insomnia, a condition characterized by not being able to fall asleep. If this happens more than three times in any week, consult a doctor. If you wake up after a long night's rest but are still tired, this could be a sign of a sleep problem, including sleep apnea. It could also be a sign of chronic sleep disorders. The sleep disorder, restless leg syndrome, causes a person to feel a creeping sensation in their legs and arms. It can also be characterized by uncontrollable twitches. Narcolepsy is a sleep disorder which causes the overwhelming need to sleep during daytime. In some cases, sleep episodes or attacks take place spontaneously causing an individual to fall asleep at work, school or in other situations. 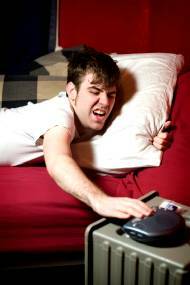 Another of the signs of a sleep disorder is unexplained sleepiness. You may be severely mentally or physically exhausted although you have done no activity to bring this on. This could be a sign of the disorder chronic fatigue syndrome. To learn about more sign of sleep disorder, visit this list of sleep disorders.